Learn how to create your own Business Capability Model in 4 steps, including useful business capability reports and views! The role of technology is shifting from supporting business processes to the very function of executing strategy itself. Information Technology allows customers to receive shirts ordered online the very next day, to read newspapers on an iPad during a commute—all while ensuring that the invoices for these services are processed without friction. As a result, the challenge of how to bridge the gap between IT strategy and execution is now critical. This gap often occurs when an organization speaks too many languages. A CEO speaks about “making mobile a top priority”; Marketing of “increasing the share-of-wallet with millennials”; and IT of “load balancing the Linux server cluster”. They speak of “missions” and “strategies”, “goals” and “processes”. But which is the right language? Business Capabilities offers the potential to operate in one common voice. 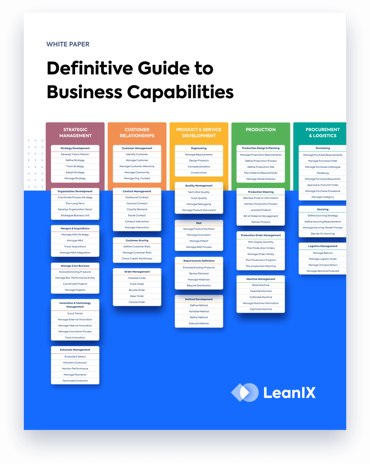 Download your Definitive Guide to Business Capabilities now!